Great swap and contest results! A couple of months ago, Keri from Knitty Gritty Thoughts and I decided to have our own little swap. I had been admiring her battlets in her etsy shop and I offered to make her one of my box bag for some of her spinning battlets. We both send each other’s package last Monday and both received ours on Friday. I think I got the best end of the deal… Look at all the goodies she sent me! There’s some fiber there, a cute notebook with and Eiffel tower key chain, the cutest fabric fat quarter and some of her awesome Spinning Project Cards. 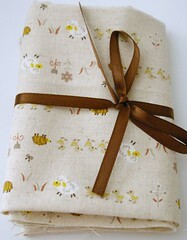 The fabric has cute sheep, ducks and hedgehogs on it… I’ll have to find a pattern worthy of this fabric! 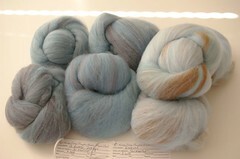 Make sure to check out her etsy shop, she dyes great roving and makes beautiful spinning battlets. She also sells cute little project bags although she has none in stock now. Thank you Keri, what an awesome swap! It’s taken me the longest time to finally pick a winner. I had 45 entries with a choice of over 100 possible names, you guys have an awesome imagination! I quickly narrowed my choices to my 5 favorites, but then it got really hard and it’s the reason why it took me so long. Last night I finally narrowed it down to 3 names that I really liked and I got rid of one only because it’s already an online store’s name. At that point I decided to let the random generator make the choice for me… And the winner is Sidney with “Stitching Mushroom”! Sidney, I will be sending you an email shortly so make sure to check your spam mail if you don’t see anything from me! Thank you very much to everyone who participated and for all your wonderful suggestions! Oh wow, thank you thank you! There were a lot of great name suggesions. I’m glad you liked mine. That fiber is gorgeous and an unusual color combination. I like it. that is some beautiful fiber! I love the color combo’s and that has to be the cutest fabric I’ve ever seen! congrats to you both! i do like that name! Beautiful fibers, oh my gosh, i would so love a knitting bag/box in that lambie fabric! adorable and so appropriate! everyone is so much more generous than i am. i’m bummed i lost. so close! fine name though, even if it’s not the one i thought of. What a good trade, I love the fabric it would make a cute bag. Happy to be a contender. They’re all great names!